Bastian Schweinsteiger, Phil Jones and Anthony Martial ruled out. Nempalys Mendy and Marcin Wasilewski ruled out. Kasper Schmeichel doubtful. Leicester City Football Club (nicknamed The Foxes, The Blues, City, and Blue Army) are a professional football club based in Leicester, and were founded in 1884 by a group of old boys of Wyggeston School as Leicester Fosse, before joining the Football Association in 1890. In 1919, when League football resumed after World War I, Leicester Fosse ceased trading due to financial difficulties of which little is known. The club was reformed as Leicester City Football Club, particularly appropriate as the borough of Leicester had recently been given city status. Leicester City have enjoyed moderate success through the years - winning 3 League Cups, and reaching the final of the FA Cup 4 times; prior to their odds-defying Premier League title win in 2015/16. Leicester City's most prominent rivals are Nottingham Forest, Coventry City and Derby County; and they have been playing their home games at The King Power Stadium (originally named Filbert Way) since 2002. Rooney on the bench at home and we will be pure class. Please don't ruin my weekend. Dreading this. Another loss would be unbearable. If Rooney starts I'm going to have a breakdown. I am so bored of early kickoffs. Don't think Herrera will start, he just had a whole game. 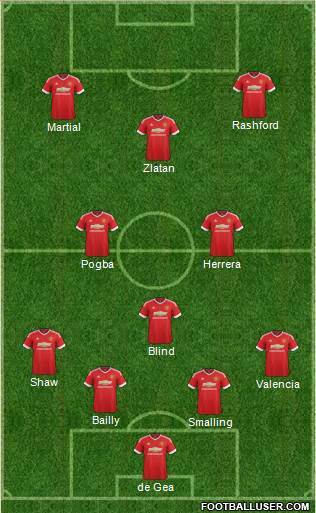 Nor that Mata can play that right-wing in a 4-3-3. Any team that doesn't contain Michael Carrick is wrong. He has to start. Is Mkhi fit? Thought the midfield was good today. Defence not so much. Rooney awful and for the first time I genuinely think he will be dropped. Isn't Shaw injured? I'm going to assume that he is. If you notice. everytime a team is selected which almost everyone agrees with, we go on to lose. So i hope Jose surprises everyone and United win. Erm what? No one has like ever agreed with playing Rooney, yet Jose has played him in every game except against Feyenoord. So I have no idea what you are talking about, any examples? Erm what? No one has every agreed with playing Rooney, yet Jose has played him in every game except against Feyenoord. So I have no idea what you are talking about, any examples? Should have said formation. Rooney doesn't count. If he has a stinker again, you never know, the crowd might start getting on his back. Definitely want to see Carrick, Herrera and Pogba in midfield. Ibrahimovic and Rashford with hopefully Mata (but probably Rooney). De Gea and Valencia are sure to come back in, if Shaw is injured I'd much rather Blind go to left back and Bailly start. No Rojo. For all the talk in the media about Jose not knowing his best team, it really is doing its best to pick itself. Martial and Shaw I'm guessing will be injured for this. Possibly Darmian in for Blind as he didn't have a great game, though both are fine and 100x better then Rojo there. Carrick-Herrera-Pogba has to be the midfield IMO, though I think Fellaini will play somewhere. Mkhitaryan hopefully back, walks into the side if so. If not... Probably Mata on the right with Rashford left? As long as Rooney is nowhere near the side and Carrick holds the midfield behind Pogba, then we will be very good I think. Are you shaw that will happen? This is how we started the secoond half against city (bar Rooney instead of Juan), and I think we played the best football so far. Going to this game, first time back in the motherland for a while. I'll be gutted if Rooney starts. Miki behind Ibra please. Lets hope for better refereeing decisions. I would Blind at LB rather than Rojo and then have Smalling and Bailly as the CBs. fecking Elbow Chin is going to play a blinder again, isn't he? All you people putting Carrick in the lineup: have you seen his flushed face after the game? He's a 35 year old, he's not going to recover for Saturday morning. Are Martial out for this one? Assuming Miki is injured and Martial is not. If they both are then Mata starts. Can't see Carrick starting so soon and without him we need Blind's passing from defence. Leicester's Slimani, if he plays, is a very powerful header. Only Smalling can deal with him. Bailly still has to learn how to do it and Blind just can't. Why do you guys think Rooney won't start? Did I miss something Mourinho said? Unless he's injured he will most likely start IMO. Him being dropped is just wishful thinking. I think Carrick will be too tired to play this, so we will have to see how Blind can do as the DM. If Shaw is injured then I'd play Blind at LB and put Bailly in with Smalling. I think Jose will want to play Fellaini but Ander deserves to start, so I have gone for him on the right of the 3 behind Ibra as he drifted out there in the second half tonight. Leicester will press our defenders hard. We need Blind to play the ball out, or we'll just end up hoofing it to Ibrahimovic.